Although there are tons of marketing tools but our digital experts has shared their opinion on top 5 Digital Marketing tools which is a need for every business today. Are you a digital marketer then you must be having a pool of digital marketing tools with you. Every tool is known to have some exquisite features but somewhere lacks behind. 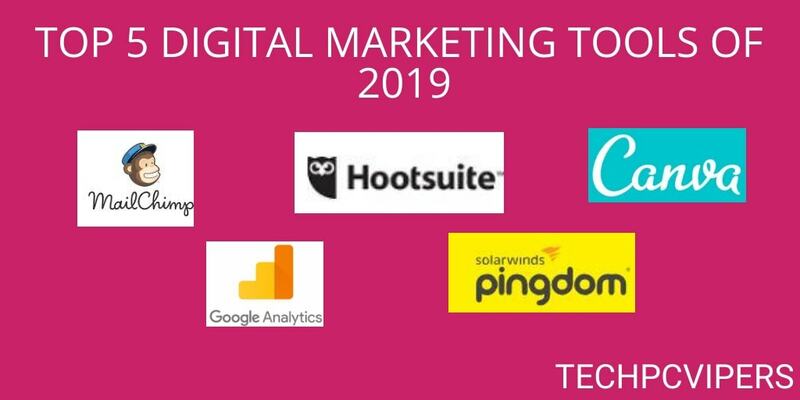 Seeing the cut-throat competition in the digital arena of 2019 is giving strong goose bumps to the marketers badly. At the end of the day the endeavour outshines the chart when it appears on the Google top list but for this one should keep a close eye on the Google Analytics too. There are many other tools that help in ascertaining the analytics and structure of the website, but this one is termed as the best and the easiest too. Many features let one monitor the site with complete reports plus is a free tool also. Together with this tool will let you know about where is your main traffic coming from and what should be your next strategy related to. Email marketing plays a vital role in gaining customers worldwide, and MailChimp is the right tool to be used for it. It helps in making the cool strategies with attractive template plus that overall increase the conversion rate of the websites. It also gives you ample space to showcase your content, product, and other services at an advanced level, so the visitors get to relate to it and looks forward to becoming your customer. Now, let us bump into the social media which is considered to be the ultimate game-changer in the digital marketing field. Almost everyone is having a smart phone are always have their attendance full on the social media platforms. It gives a great chance to a digital marketer to grab them. But it is not easy to focus on all and then HuitSuite comes to the rescue. Here you can post the requisites on any media platforms plus will get the exact social media metric time to time for building the next strategies. Appearance can never be ignored and at the same time it is all about “the first impression is the last impression.” Seeing the marketing trend and the graphic designing this tool is going to be a mandatory requirement for any digital marketer. Canva is both available at free and paid version, and the result that it gives is just impressive. This tool is one the best digital marketing tool that one should not keep aside instead must utilize for the blog post, social media post, banners and so on. Even if you are not a pro graphic designer, this tool is going to lend a helping hand for sure. Last but certainly not the least, as the speed of the website is very vital when it comes to the overall performance of the site. Now seeing the general rule the website speed needs to be one second and even by any chance if it goes beyond it to two to three seconds then get ready to see the diminishing rating of the conversion rate itself. The conversion rates are the first and the foremost things that get affected with speed thus Pingdom should be given real value, and it is worth it. It will tell you the speed of the website with the necessary recommendations as well. The aforesaid are the best five digital marketing tools of 2019, and every digital marketer must get their hands on right from scratch. It is not about creating the website as the social media, analytics, presentation and site speed are the major ingredients behind a flourishing website or channel. So, jump on these and make the most of each of them.